Siobhan Berry of MummyCooks.ie shares her recipe for Biscotti with Babyccino, a great finger food for your baby. Baking tray with some greaseproof paper. Slowly add the 2 whisked eggs and mix together until a dough starts to form. Split the dough into two pieces, and shape into two logs on your baking tray. Mix the egg yolk and the milk together and using a pastry brush glaze the logs. Bake in the oven for 20-25 minutes until golden brown. Remove from the oven and allow to cool for 5-6 minutes before slicing into biscotti. Place back on the baking tray, lower your oven 160 degrees and bake for a further 15-20 until dried and golden brown. 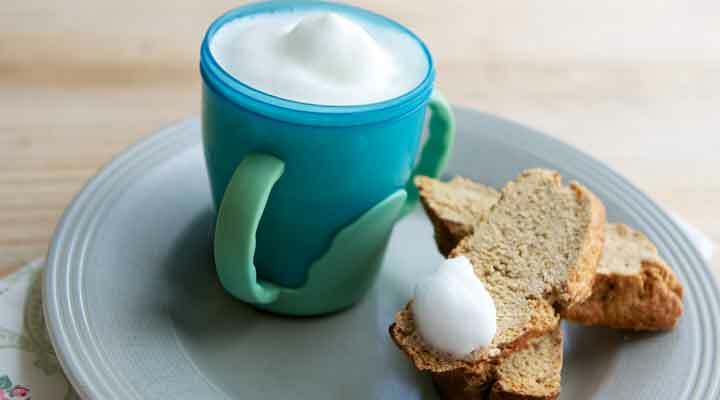 Serve with some warm frothy milk as a babyccino!